According to China Gold Association, the co-host organizer of China Gold Congress and Expo, Dr. Mark Mobius, Emerging markets fund manager and founder of Mobius Capital Partners is confirmed to be the Keynote speaker at the coming event. Dr. Mobius has been a key figure in developing international policy for emerging markets. As a recognized industry expert, Mobius appears frequently on financial industry television shows and networks. After more than 40 years in global emerging markets, Dr. Mobius has received numerous industry awards, including being named one of Bloomberg Markets Magazine’s “50 Most Influential People” in 2011, “Emerging Markets Equity Manager of the Year 2001” by International Money Marketing, “Ten Top Money Managers of the 20th Century” in a 1999 Carson Group survey, “Number One Global Emerging Market Fund” in a 1998 Reuters Survey, “1994 First in Business Money Manager of the Year” by CNBC, “Closed-End Fund Manager of the Year” in 1993 by Morningstar, and “Investment Trust Manager of the Year 1992” by the Sunday Telegraph. Dr. Mobius is happy to be the Keynote at the 3rd China Gold Congress due to the important positions of China as the second largest economy and the leader of the emerging market especially China’s becoming for years of the largest gold producer and consumer in the world. For the last ten years, China's gold industry has dramatic development in the whole value chain. With the further development of Chinese economy and consumption increasing in the domestic demand for gold, the China’s platform for the global gold industry is needed. 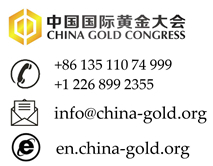 Co-hosted by World Gold Council, China Gold Congress and Expo is going to be held on July 24-26, 2018 in China National Convention Center (Beijing). With more than 2000 delegates and a hundred exhibitors, China Gold is set to be one the of the world's largest international gold cooperation platforms in China, covering Mining & Technology, Exploration Exchange, Trade & Market, and Jewelry & Consumption. Besides Dr. Mark Mobius, the industrial leaders from top miners and investment market player such as Barrick Gold, IAMGOLD, CME Group, LME, LBMA, Shanghai Gold Exchange, Shanghai Future Exchange, Industrial and Commercial Bank of China (ICBC), China National Gold Group, Shandong Gold, Zijin Gold, Zhaojin Gold and many more are confirmed to present at the Congress. At this moment, the booths are all running out and the early bird rate for delegates will expire by the end of May. More information and online registration of the convention is available at http://en.china-gold.org/.